ProLine roof deicing and gutter heat trace systems are the best available radiant heat systems for preventing hazardous ice dams and icicles from forming. We offer roof deicing systems and heat cable for all types of applications, including new construction, remodeling and existing roofs. ProLine's industry leading heat cable can also be installed in roof gutters to prevent heavy ice from building up and damaging the gutters and downspouts. 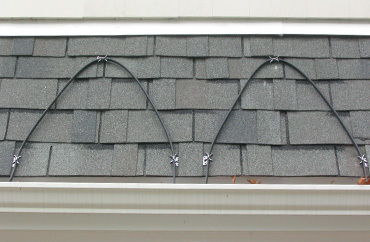 Self-regulating heat cable can also be "serpentined" along the roof's edge to help prevent snow accumulation as well. These versatile systems are easy to install and perform under the harshest conditions. ProLine offers a variety of heating cable options. ProLine offers pre-terminated self-regulating heat cable with or without a ground fault circuit interrupter as well as constant wattage cable that can be easily installed and immediately plugged in, resulting in quick, convenient heat tracing. The ProLine self-regulating roof and gutter heating cable features advanced technology that results in highly effective, energy efficient operation. The irradiated conductive core increases its heat output as the temperature falls, and decreases its output when the temperature rises. This self-regulating feature also makes the roof deicing solution very energy efficient. The heating element features a durable construction consisting of the highest quality materials. ProLine heat cable comes with a 100 percent tinned copper braid, fluoropolymer outer jacket and a continuous metal ground band. It is UL recognized under the Appliance Wire Classification (file E 76498) and meets the requirements of Section 426 of the National Electric Code (NEC). The certifications and requirements achieved by ProLine roof heating cable ensure top performance and rugged durability. The cable also features a 10-year manufacturer warranty. For more information, contact ProLine today. Most roof deicing applications are best served by using ProLine Radiant's self-regulating heat cable. 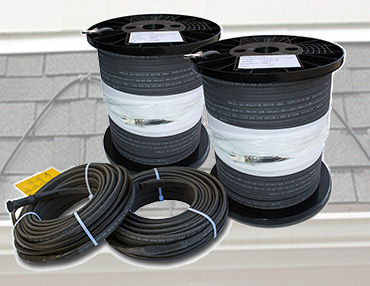 The heating cable can be installed in gutters and downspouts to facilitate runoff and keep structures safe from heavy ice damage, water damage, and frost erosion. The heat cable's self-regulating irradiated conductive core ensures that the cable will not overheat or burnout if the cable is overlapped or touching. The outer jacket is also more flexible than most other leading brands of heat cable, allowing for safe installation in colder temperatures. And because of the high-quality outer jacket is more flexible, it is less likely to pull away from the core if the cable is bent sharply. This is the most common reason that heat cables fail. When the outer jacket separates from the core, it results in water seepage that causes cable failure. ProLine heat cable minimizes the possibility of the insulation pulling away from the core when the cable is manipulated during the installation. The outer jacket, combined with the superior carbon core makes ProLine's self-regulating heat cable a trusted long-term solution for roof and gutter trace heating. "In all the years I've been installing radiant heating systems, I've noticed that "bubbles" in the outer jacked of the cable almost always result in a point of failure. The superior outer jacket of ProLine's self-reg cable helps to eliminate this problem." - Eric W. (Licensed Contractor). This rugged cable is a proven roof deicing solution that is trusted by construction professionals throughout Northern America. The quality cable, combined with ProLine's installation support and free installation training, results in successful installations and satisfied customers. View our roof heating cable comparison webpage (also available as a Heat Cable Comparison PDF), or call ProLine for more information at 866.676.9276. ProLine's low-voltage roof deicing system is fast becoming the roof deicing solution of choice among professional roofers. 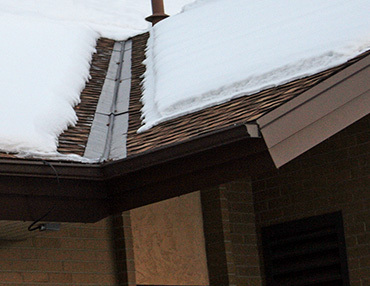 These proven deicing systems provide energy-efficient, maintenance-free operation, discreetly installed under the shingles or roofing material (including metal) to protect structures and enhance safety. The durable radiant heating element is polypropylene fused during fabrication for added protection from alkaline, UV rays and salt. 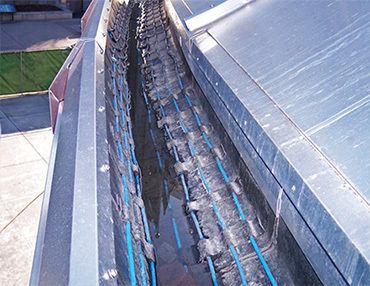 This roof deicing system is one of the most advanced and efficient roof heating systems on the market today. The heating element is only 3/64-inch thick and can even be safely installed to heat metal roofs. 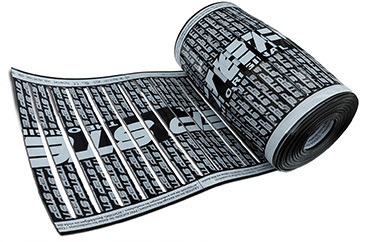 Available in rolls, the heating element can be purchased in widths of 3, 9, and 12-inches. In addition to the heating element, the low-voltage system includes an activation device (snow sensor) and a step-down transformer. The transformer is responsible for a specific section of the deicing system, and can step down from high voltage to low voltage (60V or less). It is the source for monitoring the power and output to the system heating element to ensure safe, accurate performance of the roof deicing system. After receiving free installation training from ProLine Radiant, you'll discover this system to be one of the easiest to install and safest to operate. The efficiency and reliability of ProLine's low-voltage roof heating system make it popular for commercial and residential roof heating applications in throughout the U.S. and Canada. ProLine heat trace cable installed along the roof's edge. 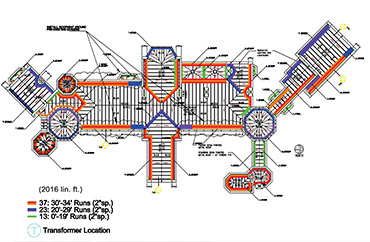 Sample of a ProLine roof heating system layout. Photo of ProLine's low-voltage roof heating element.